Why do I need +combat? The short answer is: you really don't. Any combat scene ''could'' be resolved either through consent or a set of simple +rolls. The only trouble with either of these solutions is that they require a great deal of interpretation. If Harvey shoots Bob, what does he +roll? If he gets a good success, what does it mean? If Jane also shoots Bob, how do you fairly determine whether Bob is taken out by the combination of the two wounds? If combat scenes are a regular occurrence, or if you have combat scenes involving large numbers of players, it helps to have a system to quickly, fairly, and consistently determine the outcome of the combat. Always remember that the purpose of a MUSH is to roleplay. The combat system is not meant to take the place of RP; poses are still important. Every combat scene has an organizer; this is the person who sets up the combat and makes sure everything runs smoothly. Usually this will be a staffer/GM, but it doesn't have to be. The code will let anyone run a combat; just check with your individual game policies to make sure you're allowed to. Organizer sets up combat and everyone joins. Everyone poses what they're ''going to do'' this turn, and enters their actions into the system. When everyone has posed and selected their action, the organizer triggers a new turn. The system spits out a summary of what happened. Everyone poses ''the results of what happened last turn'' and ''what they are going to do this turn'', and enters their actions into the system. Rinse and repeat until the combat is over. The system will roll all the dice necessary to figure out what happened, who hit whom, how much damage was done, whether a person was knocked out of the fight, etc. All you have to do is pose (don't forget this!) and tell the system what you're doing. The combat system supports PCs, NPCs, and vehicles. PCs and NPCs are treated generally the same. They have access to all the same commands. Anywhere you can put in a PC name as a target, you can put in a NPC name too. The only difference is that a player controls his own PCs actions, whereas NPCs are controlled by someone else - either the organizer or another player. For more information about NPCs in combat, see Combat Tutorial - NPCs. Vehicles are special. You don't add them to combat directly; they get added when someone specifies that they are a pilot or passenger in a vehicle. To shoot a vehicle, you target its pilot. Passengers may not be targeted; that's just a limitation of the combat system. Even though you're targeting the pilot, the vehicle itself takes the damage (though there's a chance that anyone inside might be hurt when the vehicle is hit.) For more information about vehicles in combat, see Combat Tutorial - Vehicle Combat. Soldier - is a ground trooper on foot. Pilot - is someone piloting or driving a vehicle. Passenger - is anyone inside a vehicle who is not the pilot. This could include the navigator, gunner, or a genuine passenger. NPCMaster - is someone whose PC is not directly involved in the combat, but who has joined in order to control a NPC. A NPCMaster may not be targeted, and may take no action other than controlling NPCs. Observer - is someone just watching the combat for kicks. An Observer may not be targeted, and may take no action other than controlling NPCs. You may switch your type at any time if your situation changes, for instance a passenger that gets out of his vehicle. A note about robots: Humanoid cyborgs/robots (Borg, Terminators, Cylon Centurions, etc.) should be treated as soldiers, with armor that covers their bodies. Vehicular robots (Cylon Raiders, Skynet HKs, etc.) should be treated like vehicles. You'll need to make a NPC to represent their AI and act as their "pilot". The combat system allows multiple combats to be running simultaneously. Each combat is given a unique identifier, called the combat number, which is assigned when the organizer starts a combat. You use that number to join a combat. You may only be a part of one combat at a time. When you join a combat as a pilot or passenger, you must specify a vehicle. See the Vehicle Combat Tutorial for more information. +combat/type <type>[/<vehicle>] - Change your type. Vehicle is required for passenger/pilot. You can use the combat system for wargames and sparring by declaring the combat as a "mock" combat. This is done by the organizer when the combat starts. Damage will be wiped out when the combat ends or when someone leaves the combat. Note: There is also a "Sparring" melee weapon. This represents someone wearing boxing gloves or hitting lightly, and is separate from the mock option. Teams are a convenient way of organizing combatants into smaller groups when they split up. PCs are automatically assigned to Team 1 and NPCs to Team 2. You can change your team at any time. The '''Combat HUD''' shows the general status of combat at a glance. For vehicle crew, their vehicle and position (pilot or passenger). For example: Viper-9387 (plt). It doesn't show their weapon since normally they'll be using the vehicle's default weapon anyway. FS3 does not use hit points/hit boxes, but instead has a custom system where wounds are tracked individually. Your overall wound level is calculated as a percentage that tells how likely you are to get knocked out of the fight after the next hit. This is shown as a damage meter that fills up the more hurt you are. Each X on the damage display represents a wound modifier of about 20%. It is quite possible for you to be at 2 X's, take another small wound, and still be at 2 X's. For more information see [How does damage work?|How does damage work?]. This shows their stance (normal, banzai, cautious, etc.) as well as their planned action and target of said action. Yes, you can attempt to "game" the system by waiting to see what your opponent does, but they can do the same to you! If you both try this tactic, the combat will drag on forever and the organizer will smack you both. Be fair and sensible when picking actions; your character is not psychic. In addition to the Combat HUD, you can also view details of anyone's individual combat status. This will show you things that aren't listed on the HUD, like armor, special modifiers, etc. You won't normally need this information but it's there if you want it. 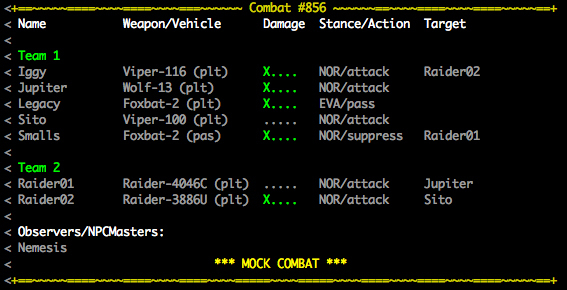 +combat - Views a summary of your current combat status. 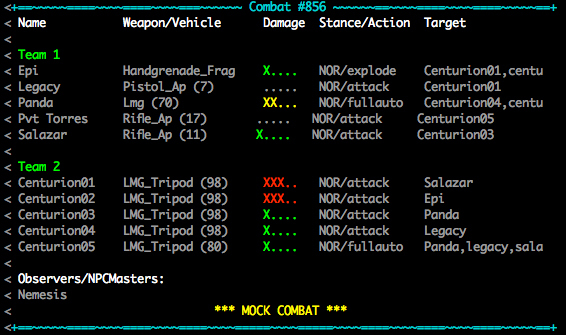 +combat <name> - Views someone's detailed combat status. Remember that the combat system is not meant to take the place of RP. Posing is mandatory. Be creative and descriptive in your poses. There are two kinds of combat commands. Preparation commands set up your character's position, armor, weapon, etc. Actions are actual active tasks, like shooting someone or applying first aid. During a given turn, you may execute any number of preparation commands, but may only select one Action. For a complete list of preparation and action commands, see the respective tutorials on Soldier Combat and Vehicle Combat. There is not a ''strict'' order of actions in FS3. Everything happens generally simultaneously. Multiple people can all contribute to taking down an enemy, and that enemy still gets one last shot off. However, there is an internal order of actions determined by each character's Reactive stat each turn. This order determines when modifiers are applied. For example: Assume that Rose is evading, Harvey is attacking Sam, and Sam is attacking Rose. Assume the initiative order is Rose, Harvey, Sam. Since Sam is going last, he must deal with both Rose's evasion modifier and any damage modifier inflicted by Harvey attacking him. If he had gone first, he would have gotten his shot off before either of those modifiers took effect. You can spend Luck Points to increase your chance of going first on initiative. See [Luck|Luck]. You can't spend luck on all three in the same turn, although you can spend luck on attacking one turn and initiative the next, as long as you have points remaining. Luck points for attack/defense/initiative must be spent at the time you're picking your action. They last for only a turn, so don't waste a point on defense unless you're pretty sure someone is going to attack you. You can also use a luck point to recover from a knockout and stay in the fight. If you take more damage you might be knocked out again, so consider that before spending luck to keep going. More on KOs in the [How does damage work?|Damage] section. Lastly, you can use a luck point to move damage from one hit location to another. Don't want to be shot in the hand again? Spend a luck point and change it! This may only be done immediately after the injury. +combat/luck <attack, defense or initiative> - Spend a luck point this turn. +combat/hero - Stay in the fight after a KO. +damage/move <#>=<location> - Spends a luck point to move the hit location of a wound to yourself. There are no 'hit points' in FS3. Instead each wound is tracked separately, and you are given an overall '''damage modifier''' (a percentage) based on the accumulated damage you've taken. The more seriously hurt you are (or your vehicle is), the less combat effective you will become, until eventually you won't be capable of doing anything but flailing around aimlessly. Players are expected to RP appropriate to the injuries they have taken. The combat system will inflict modifiers based on wounds. For more details about what these levels mean and how to RP them, see Damage Tutorial. The combat code will never kill you; only a GM can do that. The worst that will happen is you'll be knocked out, or '''KO'd'''. Once you're KO'd, you can no longer use any combat commands. NPCs are automatically removed from combat when KO'd. PCs stay in the fight but can't act or be targeted. For NPCs, the organizer will often decide that KO'd means dead/destroyed, but this is totally up to them. Remember, the combat system will never kill you. For PCs, a KO can mean any number of things. The character could be literally knocked unconscious or killed, of course, but they could also be writhing in pain, cowering in terror, their ship spinning out of control or disabled, or any number of creative ways to be rendered combat-ineffective. Even the smallest wound can conceivably KO you, though the chances are very small. A KO from a light wound could be a lucky hit that got a nerve and knocked you unconscious, or glitched your plane's electrical system, or it could be you freaking out from something that seemed worse that it actually is. If a vehicle is knocked out, the pilots and passengers are KO'd as well. This just means they cannot act; they are not necessarily hurt themselves. PCs can spend a luck point to undo a KO, and also someone can attempt to use the treat or rally commands on them to give them a chance of reviving. This is most effective if they are only slightly injured. Of course, this doesn't stop them from getting knocked out again the very next turn, so use this with discretion. +combat/hero - Spends a luck point to undo a KO.